Jagannath was returning to the staff-room after finish the last clash. From a distance he saw a peculiar statue standing on the balcony. That statue wearing half-dirty handloom check shirt and khaki pant, rook-sack on shoulder, beard on face. A little closer to approaching, he stand up straight and said smiled- Hello! Jagannath was a little surprised, then smiled at the moment and said- incompetent. Where did you come from? Arijit looked at Jagannath with smile. A little quietly said, I'm standing for about forty minutes for you. The novel created by the prominent Bengali author Shirshendu Mukhopadhyay. Read this classic novel from the pdf file. 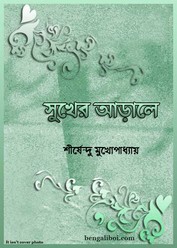 Collect the Bangla classic novel pdf download- 'Sukher Arale by Shirshendu Mukhopadhyay'.